For the Romantic view that the dreary English weather didn’t inspire great visual art, there certainly is a lot of it in London. Many art museums and galleries are free to visit. You could spend a full day…or several…exploring just a fragment of the London art scene. The Victoria and Albert Museum (fondly known as the V&A) houses sprawling floors of historical artwork ranging from ancient Greek sculpture to Chinese pottery to nineteenth-century English paintings to decorative furniture to modern fashion. The layout and feel of the museum was so familiar to me that I wondered if it inspired the art institute back home in Minneapolis, which I’ve visited countless times. Modern art gets a bad rap, but I actually loved some of the thought-provoking exhibits at Tate Modern. Set in a quiet neighborhood near the Thames, this museum has a wide variety of work, including some pieces by noteworthy artists from the past few centuries. The massive British Museum, located in Covent Garden, might give you serious museum fatigue in the hours it takes to see all the exhibits, but you will learn a lot about the ancient world and its artifacts. London is crammed full of other interesting museums that you can visit for free. Check out this list for more suggestions, including the Science Museum, the Natural History Museum, and the Museum of London. Do a free guided tour either of a London neighborhood or based on a theme like Harry Potter, ghosts, or history. Walking tours are one of my favorite ways to experience a city because you not only hear about the history of a place, but you see it as well. Do you like classical drama with a modern take? Do you like standing in crowded spaces for three hours? Then this is the activity for you! Step into the shoes of an Elizabethan peasant for a few hours and watch a play from the “Yard,” right in front of the stage, under the thatched roof of Shakespeare’s Globe for £5. Get in line early and you can nab a spot standing against the wall. Wear comfy shoes! The beautiful Gothic church in central London holds daily services—morning prayer, communion, and evensong—that allow you to bypass the ticket fee you would normally have to pay to see the inside of the building. Hyde Park has many walking and biking trails, perfect for a sunny afternoon. Start at Kensington Palace; wander through the Kensington Gardens; splash in the Princess Diana Memorial Fountain; cross over the Serpentine and take a short break to say hello to the ducks, geese, and swans that populate it; and come out near Buckingham on the other side. Either nail down the schedule of days and times when the guard changes or just wander around London enough and eventually you will run into it happening. Arrive pretty early to get a spot with good visibility near the gate—the traffic circle in front of Buckingham gets extremely crowded with spectators. The security guards also will not let you watch if you have luggage with you, for safety reasons. Trafalgar Square is one of my favorite places to hang out in London. Besides the interesting art installations and beautiful fountain, there are always performers playing music there, and the square’s status as a major tourist destination allows for endless people-watching. Bonus: there are two (!!) Pret’s across the street where you can grab a coffee or (my personal favorite) an almond croissant. London’s Chinatown is a neighborhood near Trafalgar and Piccadilly Circus that’s filled with unique restaurants and beautiful decorations, such as its gates. I especially enjoy the Fortnum & Mason tea-themed department store and the large Waterstones bookstore on Piccadilly as well as the lively & Other Stories and Topshop on Oxford Street. Oxford Street also features a lot of high-end shops like Luis Vuitton, Burberry, and Jimmy Choo, if intense could-never-afford-this window shopping is your thing. Whether or not you’re a Harry Potter fan, it’s kind of magical to take the first step of the journey to Hogwarts at Platform 9 3/4 in King’s Cross Station. Plan to wait in line for about an hour, and ask the attendants to take pictures on your phone. Scarves and wands for photos are provided there—just don’t think too hard about how many people have touched them before you. From the Victorian Leadenhall and Spitalfields covered markets to the delicious-smelling and colorful Borough Market near London Bridge, there are plenty of places to shop for quirky souvenirs or fresh fish and produce. St. Dunstan-in-the-East is a church building that was bombed in World War II, and the ruins now serve as a beautiful—and historical—public garden. We showed up on a random weekday morning, and there were still quite a few people trying to take pictures and do the iconic walk across the road. Abbey Road functions as a regular road; traffic may or may not wait patiently for you to get the perfect photo. You can write on a designated section of the community wall on one side of the street as a tribute to the band. Visiting the Supreme Court building and sitting in on cases is free to the public—a unique and interesting way to spend a morning and learn a little about legal proceedings in England. 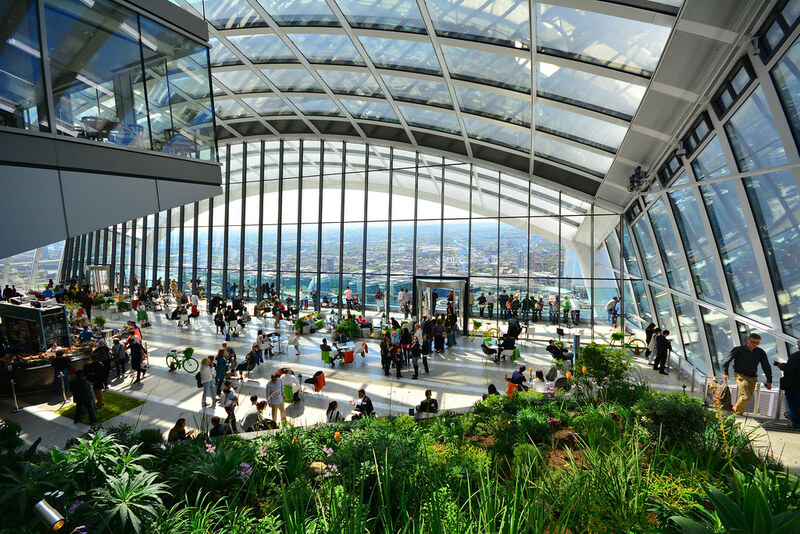 Though you must book a ticket ahead of time, entrance to this London observation deck and garden is free. The city lights and skyline are even more stunning in the evening than they are in the daytime, especially near Westminster Bridge and Tower Bridge. Try this one for weekly suggestions of low-cost talks, classes, exhibitions, performances, and music events to occupy free evenings in the city. The best way to avoid the high costs of the big city is to get out of it. If you’re flexible with days/times, use Megabus’s fare finder tool to find day trips from London that cost £12 or less. For example, most trips to Oxford via Megabus are about £5.25 each way, and I’ve spotted some fares to other cities like Sheffield for as low as £1. What are your favorite low-cost things to do in London? For more posts on UK and budget travel, click the ellipsis at the top of the page and select Follow blog via email. Thanks for reading! Some great tips here! I didn’t realise that Shakespeares Globe was so cheap, I’ve wanted to go sometime but figured tickets would be pricy! You should definitely see a Shakespeare show at the Globe! It is a really cool experience. I was surprised the tickets were so cheap too, but the low cost makes having to stand for the whole show worth it. I have a summer trip coming up and I will have a long layover in London. These tips will come in handy on how best to plan my time there while not spending a fortune! Thanks! I’m so happy you found them helpful! Have a great summer trip!